Is there a virus that infects mitochondria? It’s an organelle that has its own genetic material and polymerase, so it could replicate a virus. Does the mitochondrial double membrane and the cell membrane impose a barrier that phages cannot transpose? At the time I did not know that there were viruses that infect mitochondria, but they had been discovered years earlier. They are called, appropriately, mitoviruses. Mitoviruses have a small positive-strand RNA genome – as short as 2.1 kb – that encodes a single protein, an RNA-dependent RNA polymerase. Among the simplest RNA viruses, they are capsidless – they exist in the infected cell as RNA molecules, passed to other cells during cell division or cell fusion. Consequently there is no need for virus particles to pass through multiple membranes to infect mitochondria. Mitoviruses replicate in mitochondria, not in the nucleus or cytoplasm. The viral RNA is translated by the mitochondrial protein synthesis system, and the encoded RNA polymerase produces dsRNA, and then more positive strand RNA. The open reading frame of many fungal mitoviruses contains multiple UGA codons, which is normally a translation termination codon. However in fungal mitochondria UGA is translated as tryptophan. This finding has been used to support the conclusion that mitoviruses replicate in mitochondria. If these viruses replicated in the cytosol, the UGA codons would cause termination of translation and no RNA polymerase would be produced. 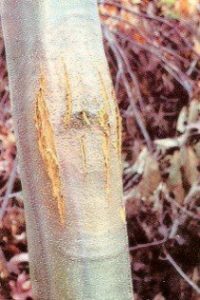 These viruses were first discovered in fungi in the 1980s and 1990s, first in the Dutch elm disease fungus, Ophiosoma ulmi, and then in the chestnut blight fungus, Cryphonectria parasitica (pictured; image credit). Since then nearly 100 mitovirus genome sequences have been obtained from multiple fungal hosts. They do not appear to harm the fungal hosts, and in some cases, they reduce the virulence of the fungus. More recently mitovirus genomes have been found in 10 different species of land plants. Because these genome sequences were obtained from whole plants, it is possible that they might come from fungi that either live within or contaminate the plant. Phylogenetic analysis of mitovirus genome sequences indicates that they clearly infect plants, not the fungi in or on them. The open reading frame of plant mitoviruses does not contain UGA codons. This finding is expected because the plant mitochondrial protein synthesizing system does not insert tryptophan at UGA codons. This observation is additional evidence for plant mitoviruses. Whether mitoviruses have an effect on plant health is unknown. Plant genomes also contain integrated fragments of mitovirus genomes, called non-retroviral endogenized RNA elements (NERVEs). Analysis of NERVE sequences reveals that they are derived from plant mitoviruses. A clue to the origin of mitoviruses comes from the observation that they are close relatives of the ssRNA bacteriophages known as leviviruses. Because mitochondria are bacteria that entered cells many years ago, it is tempting to speculate that this event also introduced leviviruses into the precursor of eukaryotes. The leviviruses then lost their capsids and became mitoviruses. Some mitoviruses might have escaped to the cytoplasm and became the narnaviruses, which are very much like mitoviruses except that they replicate in the cytoplasm. TWIV Team. It’s a beautiful 14C day at 8000′ elevation near Beaver Creek ski resort. As a credentialed sleep technologist in the mountains of Colorado the majority of patients i see deal with altitude illness in one form or another. Given the mountain topohraphy, i also spend quite a bit of time on the road between home health visits. Ergo my TWIV patronage. In your most recent discussion of mitovirosus, and brief mention of Nick Lane, it made me wonder if there is any understanding of viral infections may lead to chronic fatigue syndrome, or other sleep disorders? Thanks for the incredible audiocasting, and if ya’ll haven’t been skiing this year, dont worry there’s going to be an extended season this year. According to some multigenerational mountainmen this winter was the snowiest in 200 years. 40 years as described by the snow scientists at the colorado avalanche information center. 40 years sounds like a more appropriate estimate to me especially given that the USGS hydrology measurements being taken in the Arkansas River Valley currently show early season watershed levels that are just slightly below the all time highs that have been recorded. continuously since 1968. Enjoy listening to Vincent, Allen, Dixon, Kathy and Rich.